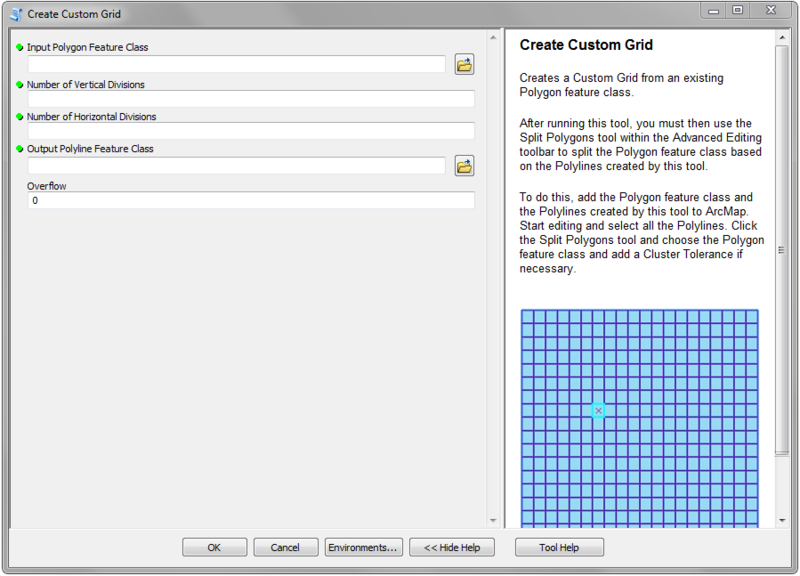 This tool allows a user to create a custom polygon grid of any size from an existing polygon feature class. It loops through each polygon feature and splits it into whatever division was chosen. This tool was created using Python, or more specifically ESRI’s ArcPy module. Be sure to view the Tool Help within the tool dialog box for detailed instructions. Also, check the Geoprocessing Results for any error messages. Okay, enough of that. I think you get the point. I hope someone can find this tool useful. Please leave a comment if you have any questions or problems, and be sure to check out the other tools I’ve created! Thanks for sharing your tools. I have used your QQ section tool as well as the custom grid and they work great. My question is about labeling custom grids. You have the script for labeling Q and QQ sections is there a way I could modify those scripts to label a custom grid? Sean- no problem! I’m glad you were able to make use of them. I’m sure it’s possible, but I haven’t sat down to figure it out because I never had a need. If I find time, I might try and figure it out. You are more than welcome to modify the code. What exactly are you using the custom grid for, and what type of labels are you needing? Do you need many different sizes, or just one custom grid size? Thanks for the comment! 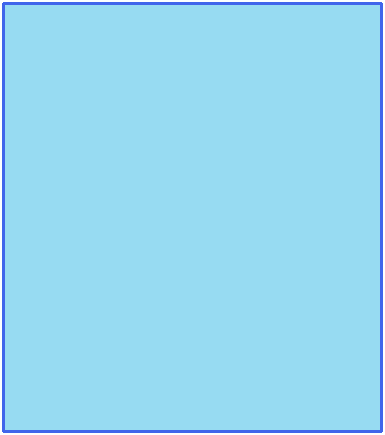 I am working on creating a custom grid based on QQ sections. 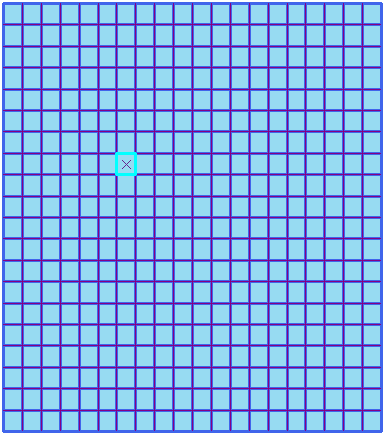 Basically I am breaking the QQ sections down further to a 6×6 grid. I would like to be able to label those 36 polygons from 1 to 36. I work for a electric utility and we will be using it to referencing easements and structures (poles, underground facilities) within the grid. I have tired to modify the script by updating the lines that reference the 1-16 QQ sections in several places but I got bogged down in understanding how your are calculating the centroids for each polygon. Thanks for your help and sharing your scripts again. Cool, I also work for an electric utility. So, you would only need the labels for a 6×6 grid. That makes it a lot easier than needing labels for many different sizes. If I find some time, I will try and put something together to do this and shoot you an email. I know this thread is a few years old now, but I’m looking for the same information. I work for a utility, and I’m trying to create a 10×10 grid within the QQ sections, labeled 0-9 in both directions. I am also having problems understanding how the polygon centroids are calculated in the labeling script. Ian, is it possible to describe in laymans’ terms how the script is doing that? Thank you so much for your time, and for creating these scripts in the first place. I would LOVE to use your script – this is exactly what I am looking for. Unfortunately in the Create QQ Section I am not able to input the line feature class, I’ve just created. An error message “Failed to execute (CreateQQSections).” follows. Hi Doreen- I’ve sent you an email. Ian this is great and I really appreciate all your work and organization via the website and video. I enjoyed reading through all your other pages for insight. A quick note on the tool is that I left the Overflow at 0. I then took my polygon layer I wanted to split and then turned it into a polyline layer (Sections in Texas). I then merged the resulting layer from your tool (QTR QTR of Texas sections) and the polyline layer of the sections. I then used the “Extend Line (Editing)” tool. This helped “grow the lines into the gaps” as the injected Section lines now act as a bounding box because they are in one layer. I then used the “Trim Line (Editing)” tool to clean up the dangles. It over all came out real clean and I just had to spend about and hour on 11 Counties in texas to manually clean up some dangles. I am now splitting my original polygon section layer with this final clean polyline layer. That should take probably 2 days as it is 11 counties in Texas with QTR QTR (8 parts)…..it’s a lot! I’ll let you know how long the split took. Thanks again as your work and great presentation was the foundation to make my analysis possible. I hope you get some recognition from the industry by presenting on this or finding some contract work via your website. Hi Dylan, thanks for the comment! It sounds like you got it under control. Thanks for providing your workflow, I’m sure it could help someone else out! Yeah, 11 counties is definitely a lot of sections. I hope everything works out with the splitting. It can be frustrating that it takes so long. I’d definitely be curious to hear how long it took. Anyway, hope the rest of your analysis goes well. This is way better than the Fishnet tool! You’ve saved me hours of work. Thanks! Hi Jason, thanks for the comment, glad you like it! Hi, thanks for creating useful tools. Is there possibility to create labels for custom grids? thanks for the useful tool, i have one question, can i use it as web app ? Hi Ahmed, thanks for the comment, and I’m glad you’re finding it useful! I’ve sent you an email. 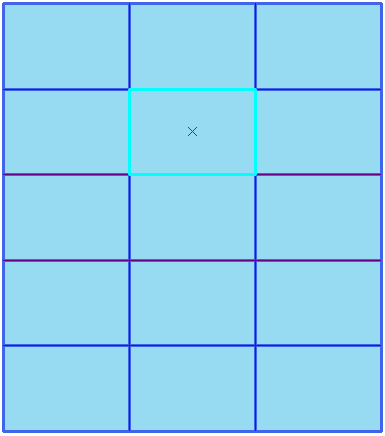 I am trying to create a custom grid that does not necessarily fit a perfect square, i.e.5 x 5 or even a rectangle, but rather more of an odd shape like an L or something (much like the one in your video screenshot preview with random appendages if you will). Is there a way to do this with this tool? If not any advice for how I might create it? Hi Joe, thanks for the comment. I’ve sent you an email to get some more information. Fantastic tool and a real time saver….except the split polygon tool doesn’t engage on my version of ArcMap HELP. I created the Q_Sec, QQ_sec and even stand-up lateral lines, everything looks great BUT when it comes time to create polygons the split tool is only available in the standard and advanced versions of ArcMap. Sadly I’m a one man shop and cant afford the $7000 version. Any work arounds in your tool to create polygons without the split tool would be greatly appreciated. Sorry, MJ, but I’m not aware of any other way currently. If I think of anything, then I’ll let you know. This tool works great except for one quandry. I have two Indian Boundary Lines running through my Townships. Due to this, all of the polygons along the IBL do not split correctly. I mainly need this tool for the QQ split, as I have the Q split already. I am trying to finagle something. I cant find script like Q section , QQ section when i added custom grid tool, any help to add those? Ian I have used your tool when I had ArcGIS 10.3, now I have 10.5 will the tool still work? Just tried your tools in ArcGIS Pro and they work great!!! Thanks for sharing!! !